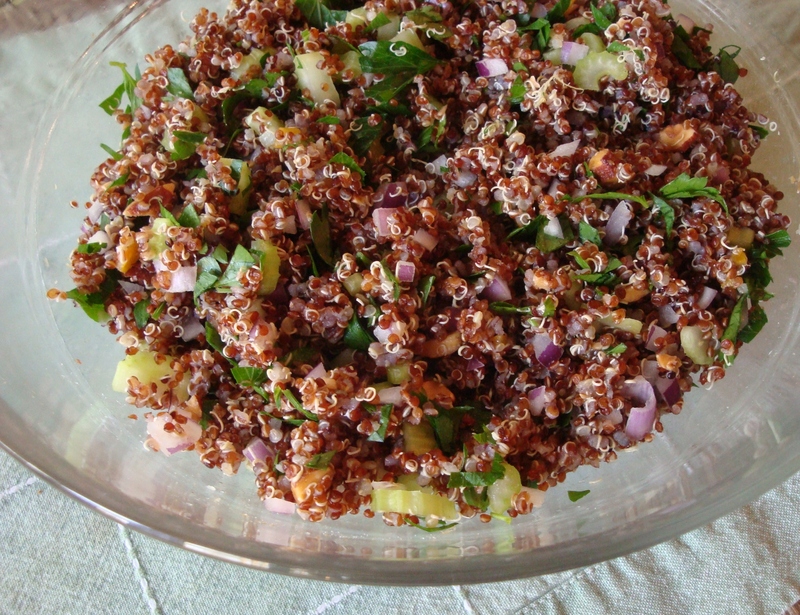 We eat quinoa like it’s going out of style in the summer. Now it’s finally fall (I don’t know about where you live, but in Chicago I thought summer was never going to end! ), and I wasn’t ready to give up my go-to dinner starter, but I’m definitely not in the mood for more salads. So this week I tested out a couple of quinoa side dishes (or in one case we ate it as the main dish with a poached egg on top) that were amazing! They’re based on a recipe in one of my old Martha Stewart magazines for quinoa hash, which is where I got the idea for the poached egg. These would be great also as side dishes for Thanksgiving dinner! 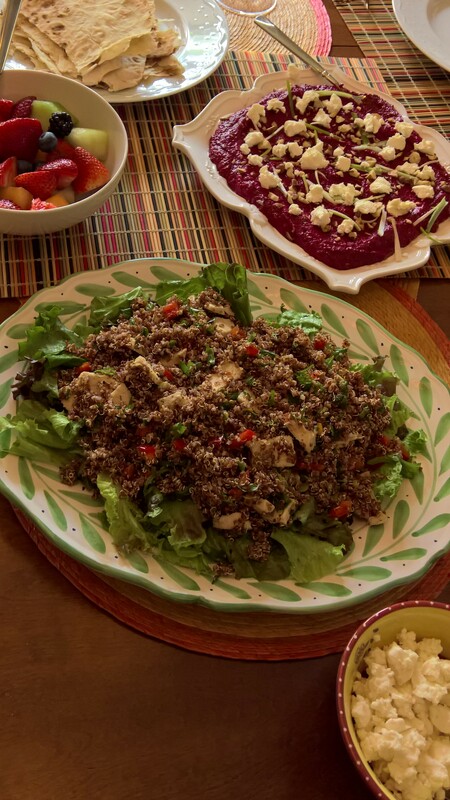 Especially if you have vegetarians or vegans in your family, as quinoa has a good amount of protein and can be eaten as a main dish. I served the beet-sweet potato one with roasted chicken, and it was delicious as a weekend meal. I see Aunt Suzy and I are on the same wavelength…her latest post is very similar to mine, with forbidden rice instead of quinoa. Can’t wait to try that one out, too! There are numerous combinations of things that you can toss with the cooked quinoa; these are just the two that I have made so far. We are on the same wavelength! 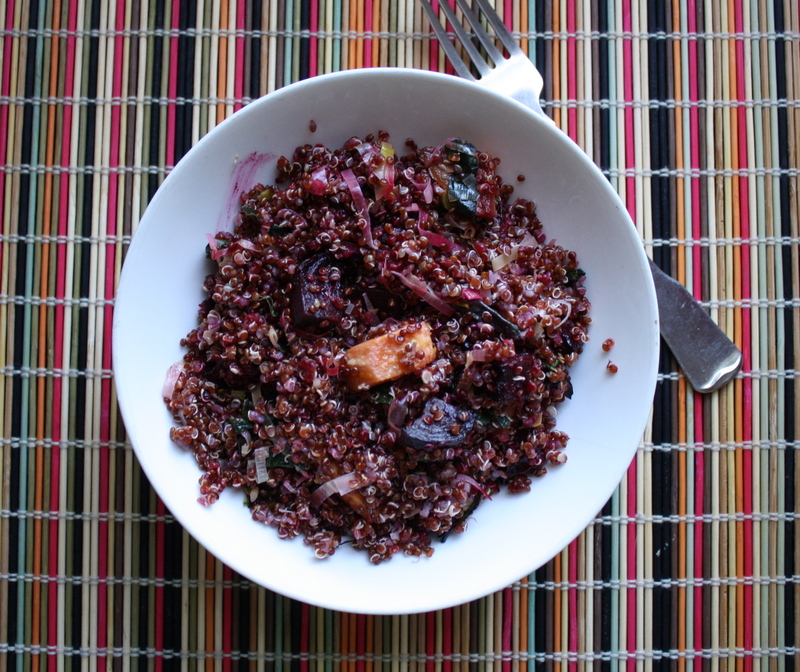 I almost put in my post that I thought the forbidden rice dish could be made with red or black quinoa! I can’t wait to try these. Preheat oven to 400 degrees. Peel and chop sweet potato into 1/2″ chunks and toss with 1/2 tbsp olive oil and 1/4 tsp salt. Spread on 1/2 of a rimmed baking sheet lined with tin foil. Peel and chop beets into 1/2 chunks, toss with 1/2 tbsp olive oil and 1/8 tsp salt and spread on other half baking sheet. Roast for about 30 minutes, until tender, stirring halfway through, taking care not to mix beets and potatoes. Meanwhile, heat remaining 2 tbsp oil in a large skillet over medium heat. Sauté leeks and thyme for about 2 minutes, until they have softened. Add beet greens and sauté until wilted. Turn off heat and set aside until quinoa and veggies are done. 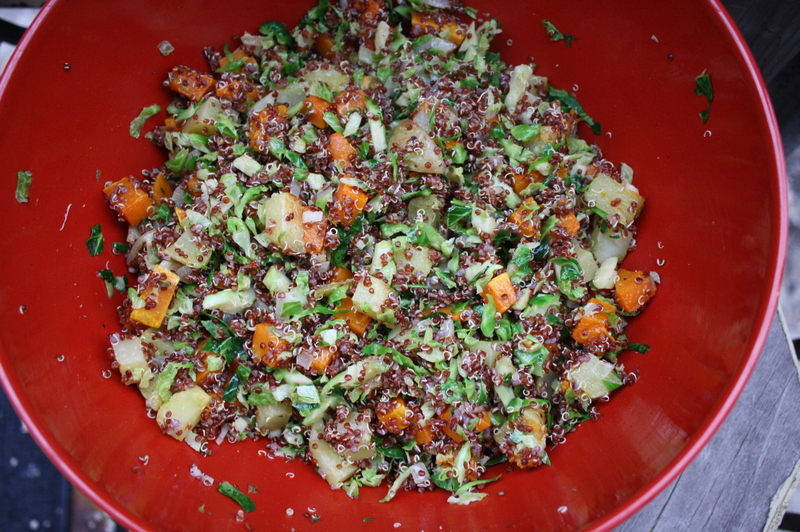 Toss quinoa, roasted veggies, and leek mixture together in a large bowl with orange zest. Add salt and pepper if needed. Preheat oven to 400 degrees. Toss potatoes and squash with 1 tbsp olive oil and 1/2 tsp salt and place on baking sheet lined with foil. Roast for about 25-30 minutes, until tender, stirring about halfway through. Meanwhile, heat remaining oil in large skillet over medium heat. Sauté onion for about 3 minutes, until softened. Add garlic and sauté about 30 seconds, until fragrant. Increase heat to medium-high and add Brussels sprouts. Sauté for about 2-3 minutes. You may want to add a little more oil to the pan by pushing the veggies to the side and adding it (I found the pan got a bit dry and added another tablespoon). Stir in oregano. Turn off heat. Combine quinoa with roasted veggies and Brussels sprouts mixture in a large bowl and mix thoroughly. 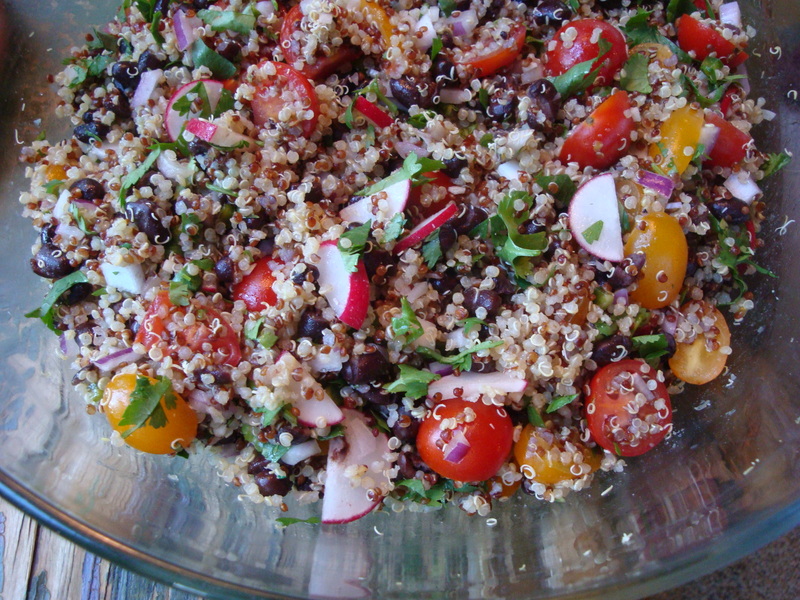 In the warmer months, we eat a quinoa salad at least once a week. Everyone loves it…including my picky son, it’s super quick and easy, and nice and healthy. I should really call this one “clean out the fridge” salad, because I often make it when I really need to go shopping and I have to just use up whatever is left in the fridge. We always have most of these things on hand because they’re all favorites of my son. I find that you can add or subtract any ingredient, based on what you might have on hand. Some other things that would be good tossed into this are avocado, parsley, chopped fresh spinach, mint, celery, zucchini, green onion, radishes, pine nuts or white beans. Rinse and drain quinoa. Add water and quinoa to a medium saucepan and bring to a boil over high heat. As soon as it starts boiling, cover, run down heat to low, and simmer 15 minutes. Dump immediately into a large serving bowl and allow to cool to room temperature. Meanwhile, chop your veggies. When the quinoa is cool, add all veggies and beans to it and mix. Make dressing: Mix together lemon juice, olive oil, garlic, oregano, and salt and pepper in a small bowl. Pour over salad and mix well. Carefully stir in feta. Serve at room temperature with warmed pita and white wine as a main dish. Also great as a side at a BBQ, or with chicken. It finally feels like spring here! 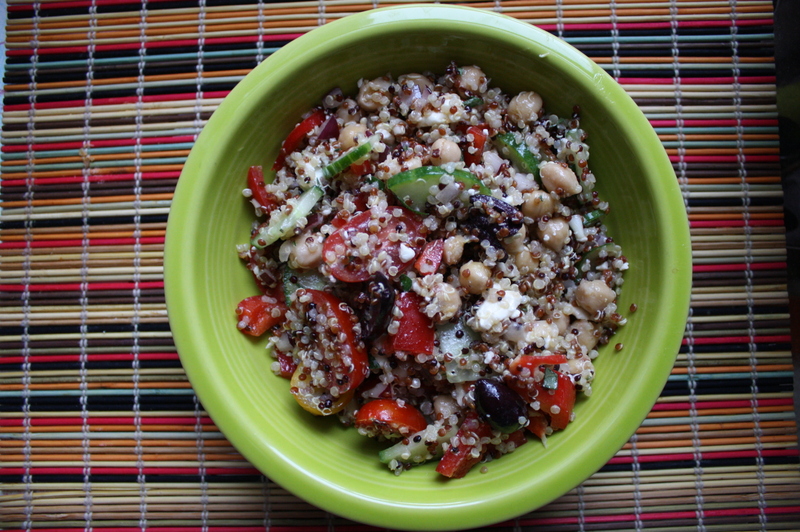 I’m not trusting it’s here to stay, so I decided to take advantage of the spring feeling and make this quinoa recipe. I’m not sure whether to call it a salad, a side dish or a main dish – it could be any of those! It can be served warm or room temperature so there are many possibilities. And, it uses preserved lemon, so what’s not to like? (It would be good without the PL if you don’t have any on hand.) I think you’ll find it’s a snap to make with many layers of flavor. NOTES ON THE INGREDIENTS: I like Trader Joe’s dry roasted Spicy and Tangy Almonds. If you use these, cut back the cayenne pepper to 1/8 teaspoon since the almonds pack a little heat. If you don’t have preserved lemon, I think grated zest of 1 lemon would be delicious. 1. If using pine nuts, toast briefly in a dry skillet over medium heat. This will take about 5 minutes, and stir constantly as they will burn easily. Set aside to cool. 2. In a saucepan, combine the rinsed quinoa, water and salt. Bring to a boil, then reduce heat to medium and cook until quinoa is tender and water has been absorbed, about 15 minutes. Cool slightly, then fluff with a fork. 3. 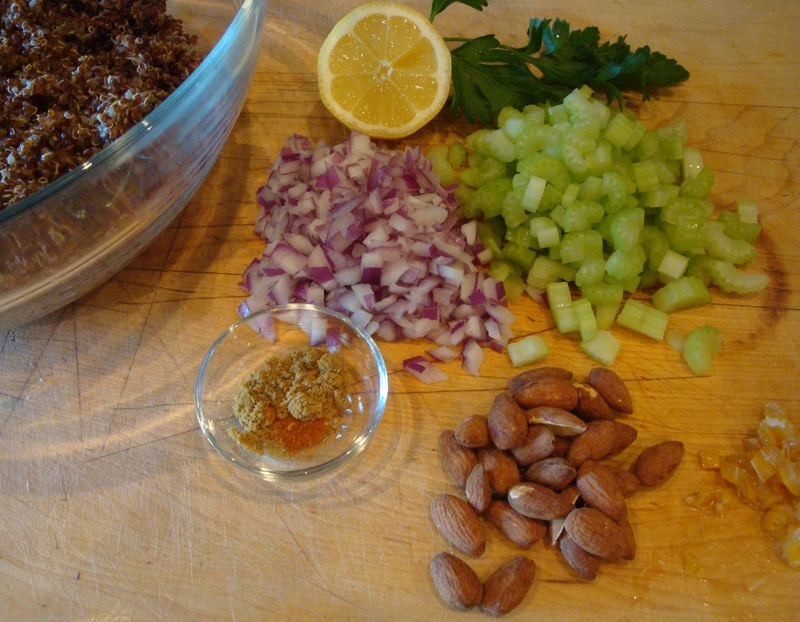 Transfer the quinoa to a serving bowl and stir in the chopped nuts, lemon juice, celery, onion, preserved lemon, cayenne pepper, cumin and herbs. Add the olive oil, then adjust salt/pepper if needed before serving. Serve warm or at room temperature. This was the first weekend for local green beans and the ones from Untiedt’s are really good. I got the green beans along with the cherry tomatoes for this recipe from them at the downtown farmers market, but I am also lucky to have one of their neighborhood fruit and vegetable stands within walking distance. 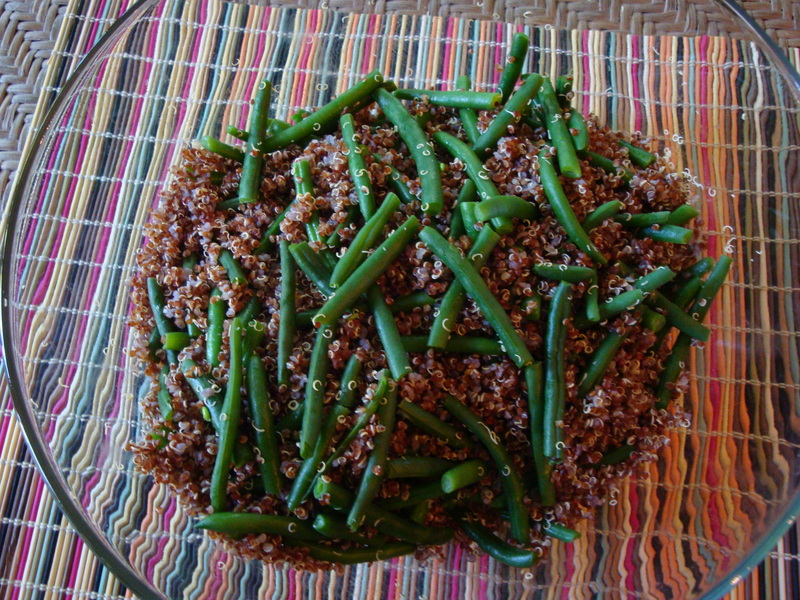 I always anticipate the first local green beans, specifically so I can make this recipe! It has many layers of flavor that surprise in every bite, even though the ingredient list is short. 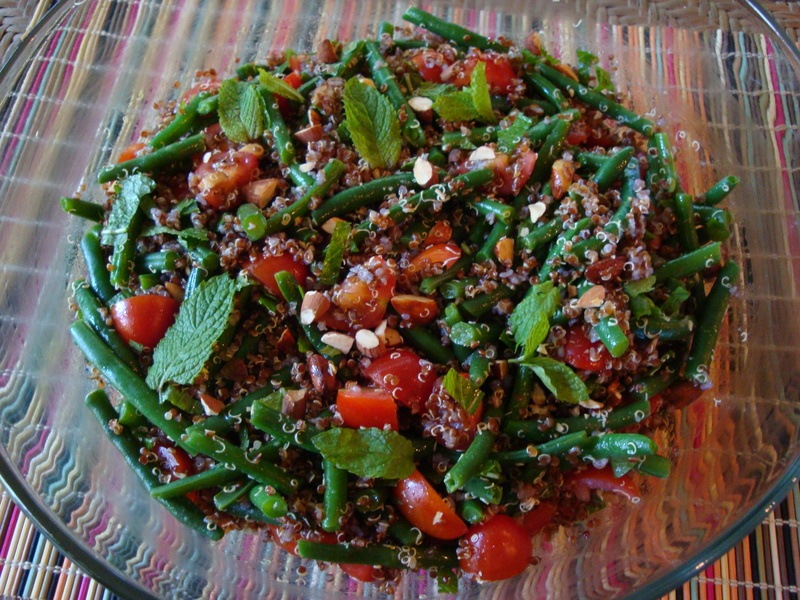 This can be served as a main dish salad (quinoa is high in protein) or as a side to roast or grilled chicken. A dry, fruity French rose wine is the perfect pairing. Place the rinsed quinoa in a saucepan and add the water. Make sure you rinse or else the quinoa will be bitter when cooked. Bring to a boil, reduce heat and simmer 15-20 minutes. Let stand for 5 minutes, then fluff and turn into a large bowl to cool. Wash the green beans. Place in a steamer, bring the water to a boil and steam for 5 minutes or until just done. Alternatively, you can cook the beans directly in boiling water for 5 minutes until just done. Either way, when done, plunge into ice water to stop the cooking. Drain and then pat dry in a towel. 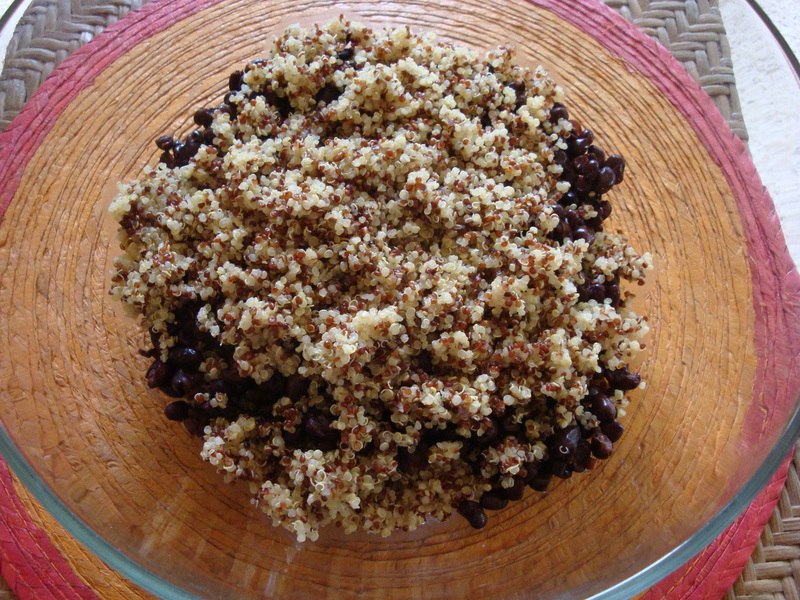 When both the beans and the quinoa are mostly cool, combine in the large bowl. Whisk the olive oil, lemon juice and salt and pepper together. Pour over the quinoa/green bean mixture. You can make this up to a day ahead. Prior to serving add the tomatoes, mint and almonds. Toss to combine thoroughly. Use some small mint leaves for garnish. Serve at room temperature.